Toau was a very special place for us, mostly because the few families that live there included us in their daily activities. See the Toau Destinations page and the Toau Newsletter page for more on this. 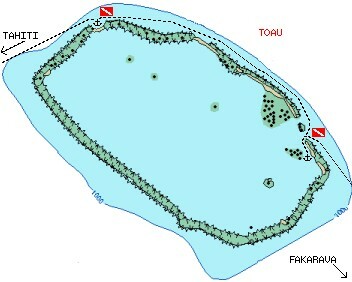 Toau is just 15 miles from Fakarava. Since all boats left after the Fakarava Fete, we ended up traveling with the much same crowd as before, which suited us just fine, as they all had divers aboard, extra scuba gear to loan, and dive compressors. We did 2 dives on Toau, the Otugi Pass through the eastern entrance, and the Anse Amyot Wall up on the northern edge of the atoll. Both of these were open-ocean wall dives, and neither were "marked" dives in any way - we just decided to go out and see what we could find. 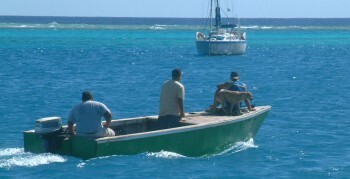 We did both dives with folks (and borrowed equipment) from L'Ondine and Cowrie Dancer. (Jon) Chris and I did this dive with Dale (Cowrie Dancer) and 2 folks from L'Ondine. I borrowed a small bottle from Dale and Chris used (fancy new) gear from L'Ondine. We dropped from dinghies a bit SW of the pass, in 30' (10m) of crystal clear water, with Sue and Amanda keeping pace with us in the dinghy. The reef was very steep on the outside, essentially a cliff, so we could pick our depth. We eventually drifted down to about 70' (20m) and slowly made our way NW towards the entrance to the lagoon. The fish were generally very tame, often coming to within arms length of us. This included some inquisitive 4-5' (1.5m) sharks, which insisted on circling back to check us out one more time. Since Chris and I were at the back of the pack, I found this a bit disconcerting. The wall had almost no current, and excellent visibility, which was delightful. 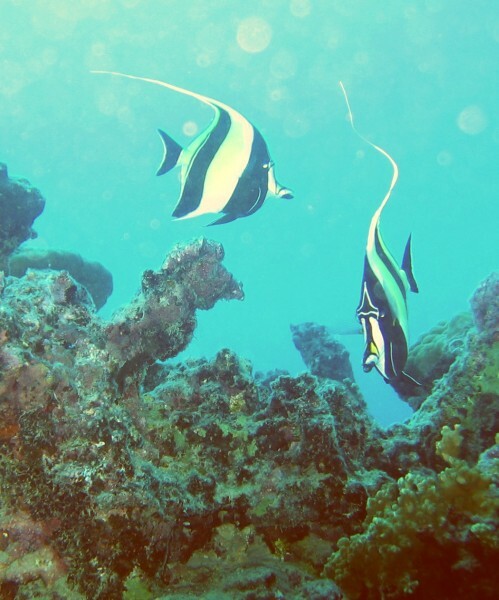 Both the fish and coral were plentiful, so we were content to drift slowly. When we felt the tug of current, we knew we were under the 30' (10m) deep entrance to the pass. We continued along the face a bit more and then started drifting up the wall. The current was much stronger in the pass. Here we also saw about 10 somewhat larger sharks, hanging out and waiting for their lunch to swim by. We grabbed onto some coral (both hands) and watched to see if they'd catch anything, but apparently nothing appetizing came along. Despite the current, the coral wasn't as nice in the pass, with large patches of bare ground. There were several fish, but the current pushed us along too quickly for easy identification. So we came up for a quick safety stop and surfaced to find the dinghies not far away. Coffee and cake on L'Ondine afterwards, which was nice. (Chris) The first part of this dive was truly excellent. A very light current carried us towards the pass, enough that very little effort was needed to move forward but not so much that we couldn't move around at will. In fact, if there hadn't been a current (and if the other divers hadn't been swimming with it) I might have hardly moved at all. Everything came to us! 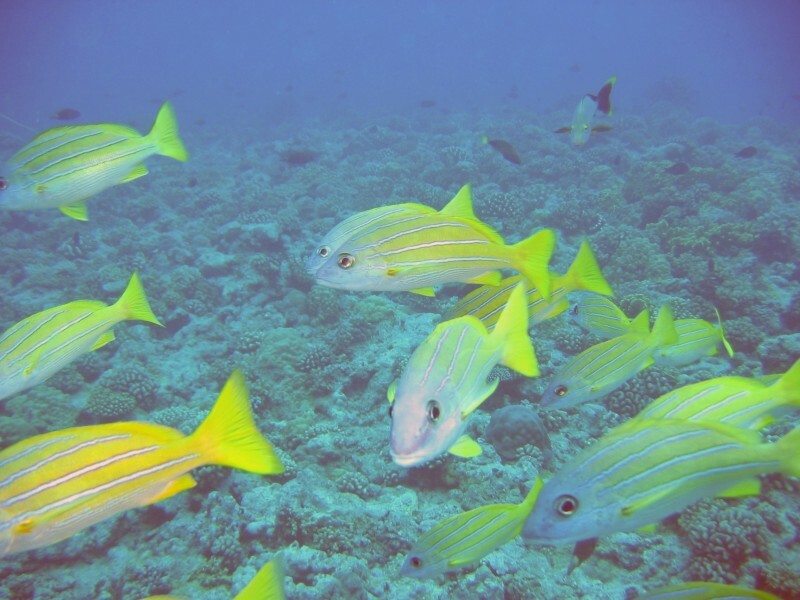 Large fish swam past, sharks circled, and a few feet away was a sloping garden of coral. I really wish I'd had the underwater camera then, there was so much to see. The water clarity was incredible, maybe as much as 140 feet (40 meters) outside the pass, and the reef was alive all around us. Anywhere I looked there was something to see. After we'd drifted outside for a while, we all noticed the current increasing, and pulling us upwards. The pass was only about 20' (6m) deep at the entrance, and the current got quite fierce for a bit. However, once we were passed the rush of the mouth, we looker around and saw a group of grey sharks (larger than the black-tip reef sharks we usually see) circling around an area off to one side. The current was too strong to swim against, so we grabbed rocks (not living coral, of course) and hung on while we watched. The visibility was less astonishing here, perhaps only 50' (15m,) but the sharks were only about 30' (9m) away! After we'd watched the sharks for a while, we let go and continued to drift into the pass. The current decreased as the pass deepened slightly, but there was less to see. (Sue, in chase-boat): Jon rejected the Styrofoam ball idea that we'd tried in Fakarava as too unwieldy, so we relied on surface boats to keep track of the divers. The crew from L'Ondine, a Swedish 60' Swan, manned one chase-boat and Amanda and I took our inflatable dinghy. We were able to take turns snorkeling over the side, usually holding on to the dinghy, to watch the divers below. 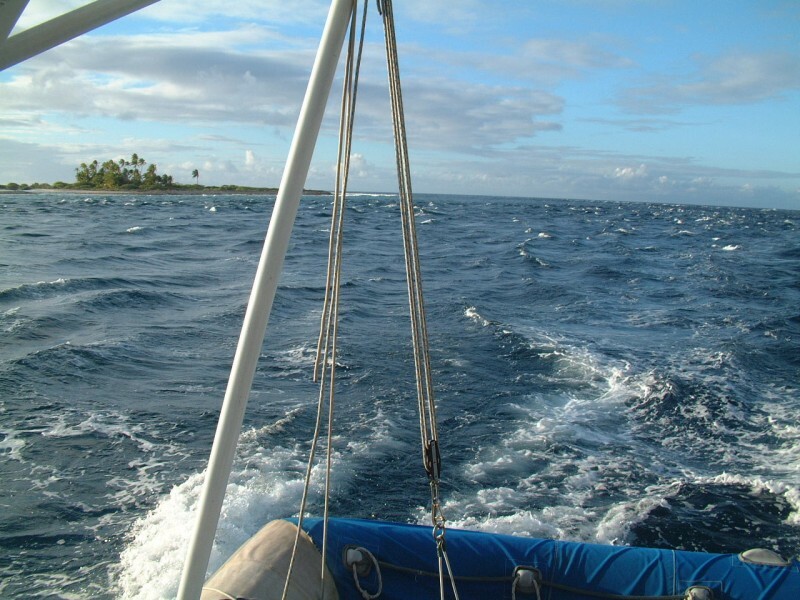 Because we drifted at a different pace and direction than the divers due to the surface currents and the wind, we had to frequently motor back into position over the divers. Those with yellow or lime green fins, tanks, or skins were the easiest to locate. Those with blue and black faded into the background. The water was so clear that at one point I thought of free diving down to wave to Jon and Chris, and later learned that they were 70 feet down! In settled conditions, closer to reef. Few sharks. Nice coral features at many depths. Some current. Needs settled ocean. (Sue) A fabulous dive site! We planned this dive along with two other cruising boats for slack tide, about mid-day. We had 3 chase-boats: inflatable dinghies manned by Amanda and Jon while Chris and I dove as buddies. Six others dove as well, with the decision to allow buddied pairs to surface together if needed. 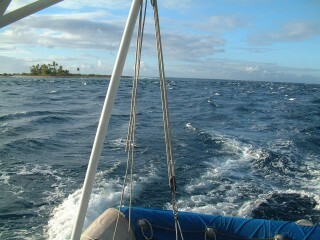 We motored about a half a mile north of the mouth of Anse Amyot, maybe half way to the point. We entered the water in 25 feet, which was about as close as the dinghies were comfortable holding position, then swam to the wall. The warmth (low 80's, with no noticeable thermocline) and clarity were superb, and we dropped to 90 feet to begin exploring the coral-festooned wall. The most common corals were plate-like Montipora, both branching and encrusting Millepora (fire coral), and forms of Acropora. Surprisingly, we saw no sharks. Fish species included several large tunas, giant moray eels, Moorish idols, surgeon fish, butterfly fish, and groupers. By the end of the 45-minute dive, we had ascended to about 15 feet for a safety stop, with another at 10 feet, while drifting south towards the pass at about 1.5 knots. It was nice to see the chase-boats right there ready to pick us up. (Chris) This was my first dive to more than 70' (21m) and I was a touch nervous, but there was no reason to be. The dive started out beautifully, descending slowly to 90' (27m). The wall didn't really start until 30' or 40' (9-12m) but there was coral right up to the shallow sand patch where we'd entered the water. The amazing thing is the way the wall kept on going; even at 90' I couldn't see the bottom even when I was only a few feet from the reef. I've heard that the wall goes more than 200' (60m) down before starting to level out. We wanted to see more of the wall than our depth would give us time for, so after a few minutes at 90' we started slowly moving upwards. We passed some large fish, but not the schools of little fish that were so common elsewhere. We didn't see any sharks either, but there were some very fine moray eels looking out from the coral. The coral itself was very impressive; we saw several different kinds, many different colors, and very nearly the entire wall was covered. The other life that we saw in great abundance was sea cucumbers. They were everywhere, large or small, rough, pointy, or smooth, in a wide variety of shapes and colors. The light increased slightly as we rose, but even at our maximum depth there was around 100' (30m) of visibility. We spent 40 minutes or so coming up, but my mom and I were running low on air. We made safety stops hovering over the lip of the reef, watching the dinghies (all three of them rafted together) motor along above us. When we surfaced, they were right there and ready. (Jon) Amanda and I actually had fun up in the chase-boats. We tied all 3 dinghies together so we had a big raft and enjoyed the cool breeze. We were thinking that it might be hard to follow the divers and that we might have to snorkel over them to see where they were, but this wasn't necessary. The divers were deep enough and the water was calm enough that we could see their bubbles quite clearly. In fact, we could see that they'd split up into about 3 groups. Every once in a while the breeze would push us away from the bubbles, so we'd try to maneuver our big dinghy-raft back to the bubbles. Since this was rather difficult, it was accompanied by much hilarity and laughter. We were able to be right there when the divers surfaced.